uncanny correspondence with a consensus of predictions deriving from these Prophecies. We are living in tumultuous times. A time of change and transition where we are witnessing cultural and technological progress happening at dizzying speed. All the while changes happening to the planet environmentally and political are ushering in a world that will be very different from what we know today. And not only is the pace of change frantic, the speed at which this global transformation is taking place is actually accelerating. So what is happening in the world? How can we understand this process that we are living through? What's going to happen next and where is it all leading? A key to understanding the world in which we live and what's happening on the planet is the prophecies contained in all the World's great religions. Prophecies which talk about the future state of the world can be found in just about all of the world's major faith traditions. When we read what these prophetic scriptures have to say then we find recurrent themes and common narrative threads. This would make sense if we take it as our starting point that all religion is one (as is shown in a separate article on the unity of religion). That is, if the World's religions are really worshipping the same God and asking after the same truth, then by the same token all the different prophecies in the different religions should all be coming from the same source. Therefore it may also reasonably be supposed that all these different prophecies are really talking about the same set of events and circumstances. Of course we should expect some incompatibilities in the details of certain specific prophecies and not all prophecies are necessarily valid. However the overall and general picture painted by all of them collectively should provide us with a coherent and consistent picture that may have some meaningful relationship with the realities of the world today. This of course assumes that the present age is special and that the prophecies of the World's religions are referring to present times. Here I will show unequivocally that this is indeed the case. It can be argued that we are certainly living in a unique moment in history. I will show that the things that make the World in which we live today so special, unique and unprecedented, are exactly the general conditions of the planet collectively portrayed in the prophecies. 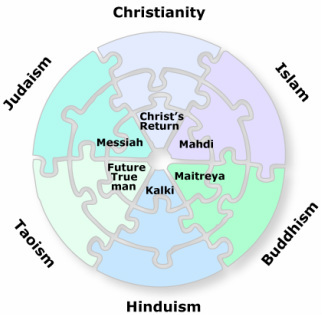 This diagram is meant to show how the prophecies contained in the World's different religions fit together like different pieces of the same jigsaw puzzle. This assumes that all the different prophecies are coming from the same source, which naturally derives from the sensible belief that all the World's religions are really worshipping the same God. And indeed all the different prophecies come together to uncannily describe the special and unprecedented conditions of the World in which we live today. Whenever it is proposed that the prophecies are finally about to be realized, a very common reaction is for a lot of people to say that the prophecies can be made to refer to any point in history. It will often be pointed out that indeed throughout history many individuals and groups have committed themselves to the firm belief that the end is finally nigh, only to have their expectations disconfirmed. However, today we really are living in a time like no other. There are conditions and circumstances in the world today which have never appeared before at any time in past history. Furthermore it is also the case that the things which make the world in which we live today so special, unique and unprecedented are exactly those general conditions of the world which are described by some of the prophecies contained in the World's great religions. Examples of this will be given a little later. I believe it is these types of prophecies that describe the special general conditions of the modern age which are most interesting and useful. I should also mention at this point that together with the kinds of prophecies which describe the general conditions of the planet when the appointed hour comes, there also exist a myriad number of rather specific prophecies. These prophecies predict a variety of precise circumstances and well defined events which have actually been realized in recent times. Also related to the kinds of prophecies so far discussed there exist predictions based on specific calendar dates and special numerical calculations. Many of these likewise suggest that the time of the final and ultimate realization of the prophecies is around now. An example of this kind of prediction is the expectation contained in the Mahayana Buddhist scriptures which tell of the coming of the next Buddha to be 2500 years after the last one i.e. Siddhartha Guatama. Another example would be one which is much referred to by 'new age' types and some of the 'psychedelic crowd'; this is the ancient Mayan 2012 calendar prediction for the end times. Again, like many other of these types of calendar predictions, the suggestion is that in the present times we are approaching what is sometimes referred to as 'the end of time' or else 'the end of the age or cycle'. These very specific prophecies and calendar-based predictions are interesting in themselves and support the case that the time of the great happening is about now. However, these kinds of prophecies are not the most interesting or conclusive, I believe. The prophecies which are more relevant to understanding what is happening now, and also more certain in their correspondence with the present state of the planet, are those prophecies that describe the over-all conditions of the World when the end of the age is nearing. I will now focus our attention to these prophecies which describe the special and unprecedented general conditions of this world. So what are these special and unique general conditions of the world in which we live? Also what are these current and critical issues which are described by and have a bearing on the unfolding of the prophecies? I'll list them here and will then immediately elaborate upon them further.. The coming one world order, the process of globalization and the formation of the so called Global Village. Through modern communications technology and advanced systems of transport and logistics, humanity is being brought together like no other time before. The ongoing and unprecedented destruction of the world ecological system and also the deleterious changes being wrought upon the environment. Like no time before in recorded history there is now most definitely a planet to be saved. The universal decline of world religion, characterized by its falling away into Secular Humanism and its degeneration into Religious Fundamentalism. This is an unprecedented phenomenon brought about by an unprecedented cause, i.e. the rise of Scientific Rationalism. The state of humankind's knowledge of Universe and life on Earth. Not only is this the age of information but also the incredibly rapid and accelerating pace of the accumulation of knowledge that we have witnessed in recent history has most certainly been unprecedented. One of the most noticeable changes taking place in our world today and in recent history is this process called Globalization. Undeniably the world is becoming one place and all the people on this planet are becoming integrated into an all-encompassing entity called variously the 'Global village' or the 'One World Order'. Through the process of international trade, cultural exchange, tourism, economic integration and political union, the human race is being brought together on a scale and extent never before seen in the history of the World. Also through the enabling technologies of the Internet, the jumbo jet and other logistical and communications systems, the widely dispersed members of the international human community are being brought much closer to one another, and the vast distances which separate us are being made less apparent. The people of this world are living at a level of interdependency and interaction that is truly unprecedented. Never before in world history has there been anything like the formation of this One World Order that we are witnessing today. So what has Globalization got to do with the prophecies? When reading some of the prophecies we do find reference to the idea that at the end times, the human race should have become somehow integrated and brought together into some kind of global entity. If we think about this passage then obviously until recent times the creation of a world state would have been impossible. It is only today that we are on the brink of this state of affairs being realized. In the Book of Revelation in the New Testament, which gives the most vivid symbolic descriptions of conditions and circumstances relating to the end times, we find things being described happening on a global scale. So in the Book of Revelation we find that the expression 'whole world' is used 4 times, the word 'world' is used 8 times and the word 'earth' is used around 60 times. So there is no doubt that the prophecies as related in the Christian scriptures are describing events unfolding globally all across the planet. Again, this process can only really be made manifest in present times, and at no other time in history. Indeed there are evangelical missionary groups in the United States which are systematically trying to complete this process of the propagation of the Christian Gospel. Today the Bible is being translated into the most obscure and uncommonly spoken languages, in order that evangelical missionaries may be able to preach to the most isolated peoples and tribes of this World, living in the remotest regions. They are doing this to make sure the necessary conditions are in place so that the coming of the prophecies, they believe, may be hastened. If we examine the Hindu scriptures then the descriptions for the Kalki Avatar, or the next full manifestation of God on Earth, are of a World Avatar whose influence and power will be global and not limited to any one country, continent or culture. So we find this passage in the Hindu scriptures.. So there is a close and meaningful relationship between the formation of this global village that we are witnessing today and the prophecies of the World's religions. This all makes perfect sense when we consider that one of the processes that has been happening throughout human history, and indeed throughout the history of the evolution of life on Earth, has been this process of things coming together. Atoms have come together to make organic molecules, which then have come together to form single-cellular animals. In turn these bacteria-like life forms evolved into multi-cellular animals which, through the steady course of evolution, has given rise to life as we know it today. Continuing this process, the complex life forms so formed have in turn organized themselves into herds, shoals and colonies. When this process is applied to human beings, then it has led initially to the formation of hunter gatherer tribes, which over the course of time coalesced into primitive societies. And so on to the formation of kingdoms, nation states, empires, trading blocks and other unifying political entities. Seen within this context, the coming one world order and the formation of the Global village is the natural conclusion of a process that has been a feature of this planet since the beginning of life itself. Indeed it might be considered the culmination of human history and the completion of the purposeful process of the evolution of life on Earth. We turn our attention now to the second of our special and unprecedented general conditions of the World today. Without a doubt we are living through some pretty turbulent and dangerous times. Recent history has been characterized by some of the greatest conflicts and wars known to mankind. From global warming, environmental destruction and the depletion of the World's natural resources to the possibility of nuclear annihilation, never before in recorded history has the planet, and all the people living on it, been in such a precarious state. There are various factors and trends happening on this planet which threaten the future existence of civilization and the human race itself. Some commentary would probably be helpful here. Without a doubt all through history there have been wars, natural disasters and also famine. However the Second World War which took place in the 20th century is quite unprecedented. Nothing like it has ever happened on the same scale, extent or level of destruction. As for natural disasters, because the world is so populated it can be argued that mankind is definitely more affected by phenomena such as earthquakes than at any time before. Sadly and worryingly it has been projected that one of the effects of global warming will be adverse consequences for agriculture, particularly in the Third World. This planet is set to bear witness to famine of extreme severity and unprecedented extent, which will affect a large proportion of humanity. Probably nothing that has happened before will compare to this future scenario. In the above prophecy from Buddhism, again we find the themes of famine and war but it is explicitly mentioned here that what is being talked about is its occurrence on a global scale. In this prophecy from Hinduism we have mention of upset weather patterns. It is predicted that as the planet gets warmer in the coming years, then indeed we are certain to see an increase of severe storms and hurricanes. Already a mere 1 degree rise in sea temperatures has over the past fifty years produced a doubling in the frequency of category 4 and 5 hurricanes, which are the most intense. Also the number of really big weather disasters has increased four-fold compared to the 1960s, according to a spokesman from GE Zurich, which is one of the largest re-insurance companies. Re-insurers being the firms that insure the insurance companies. All this indicates that it is already the case that the weather has become more violent and changeable in the past few decades. Referring back to the passage, repeatedly this prophecy refers to fire and burning. This could be a reference to the huge man-made fires which have destroyed vast swathes of tropical rainforest in Indonesia and Brazil. More ominously, the passage may be hinting at the destructive fires that inevitably follow the detonation of nuclear devices. Interestingly, Chernobyl, the name of the Soviet nuclear reactor which released so much radioactive contamination when it went into meltdown, means 'wormwood' in Russian. So the perilous conditions of the present age have indeed been prophesied long ago. What is happening to the planet and the environment are certain indicators that the time of the prophecies is indeed now. This precarious state that humankind finds itself in can be seen as the necessary preconditions for the unfolding and realization of the prophecies. After all, you can't really have a World saviour unless you have a planet that needs saving. It is said that wherever there is chaos there is also opportunity. Seen in this light the problems that the World faces today are really a transitional state, out of which something better will emerge. The third unprecedented state of the world today is the universal decline in world religion that we have been witnessing in recent history. This is an unprecedented state of affairs brought about by an unprecedented cause. That is the rise of Scientific Rationalism which has been accompanied by a Materialistic philosophy and ideas such as Darwin's Theory of Evolution. This has produced the falling away into Secular Humanism and the degeneration of religion into Religious Fundamentalism and New Age. What the rise of Scientific Rationalism, supported by the dizzying technological advancements of the past few hundred years, has done to religion is this. Where religion once provided a foundation for morality, a view of man's place in the grand scheme of things and intimations to the eternal, this is no longer the case. Instead we have a void created by the rejection of all those religious ideas that people no longer find tenable. So what the rise of Scientific Rationalism has done is to challenge and usurp religious truths once considered as certainties. But at the same time science has not really been able to address humankind's yearning for the transcendent and the spiritual; science hasn't really been able to provide satisfying answers for questions such as 'Who am I? Why am I here? What happens when I die? and, Is there a God?'. And so we have the postmodern condition, a state characterized by doubt, uncertainty, meaninglessness and the relativity of values. It is this which is symptomatic of the worldwide decline of religion. At this point the reader might counter this view with examples from the Middle East, the United States and perhaps parts of Latin America where it seems that people are extremely religious and where regular Church or Mosque attendance is high. I would agree with anybody who said that Religious Fundamentalism is strong and is attracting large numbers of people to its fold. But in reality, Religious Fundamentalism is the very antithesis of religion as laid out by its founders. Where religion starts out with ideas of progressiveness, tolerance, peace and compassion enshrined within its original make up, in the hands of the Fundamentalists of this world religion is altered into something characterized by a retrogression, intolerance, and a conditional compassion. Sometimes Religious Fundamentalism will even gravitate towards a certain tendency to hatred and war. So Religious Fundamentalism is really religion corrupted and usurped by the baser human instincts. All too often, under the guise of Religious Fundamentalism, religion has become subverted to the cause of Nationalism and other political motivations. So Religious Fundamentalism is a sort of retrogressive retreat motivated by a longing for moral certainties and a sense of the sacred, in the face of an ongoing scientific and technological, materialistic onslaught of the soul and the divine. However in the process a lot of the original values of religion become lost. Now, I don't deny that many people of this world still adhere to the outward manifestations of religion, that is its rules, its rituals and regulations, without being remotely Religious Fundamentalist in any way, shape or form. However, even though people may be outwardly observant, when we examine a lot of modern religion closely we discover what is really behind a lot of modern spirituality. Often it seems to be the case that modern religion is either dressed up superstition or else a sort of glorified social club providing people with a needed sense of community. Thus religion has become diluted and is very far removed from its original objectives. What follows is a selection of prophetic passages from some of the main religions of the World which speak of a decline in the true spirit of religion, and also a state of moral degeneration that accompanies the end times or the final days of the current cycle. 'The time is near in which nothing will remain of Islam but its name, and of the Qur'an but its mere appearance, and the mosques of Muslims will be destitute of knowledge and worship; and the learned men will be the worst people under the heavens; and contention and strife will issue from them, and it will return upon themselves. ' - Islam. Hadith. 'Immediately after the tribulation of those days shall the Sun be darkened, and the Moon shall not give her light, and the stars shall fall from Heaven, and the powers that are in Heaven shall be shaken .' - Jesus NT Mark 13:23-24. We now move on to the fourth and last of our special overall conditions of the present age. There is something very special about present times that is not obvious to most ordinary people. It is a process that is much less visible than the ongoing changes wrought upon the environment, and also one that is less easy to grasp than the formation of the Global Village. What I am talking about here is the current state of humankind's collective and accumulated knowledge in all areas, and in particular science. Since around the time of the Enlightenment onwards, the systematic advancement of human knowledge has been rapidly increasing what we know about ourselves, society, the Universe, life on Earth and also a myriad variety of other subjects. Indeed not only has this process been steady and unabated, in recent times this ongoing increase in things that we know and understand has actually accelerated. However, even though we are collecting more minute details about all the things in the Universe that there are to know, at the same time progress on the really big questions seems to have reached an impasse. These questions concern matters such as the nature of existence, the puzzle of consciousness, the beginning of the universe and the purpose of life. It is my belief that we are on the verge of gaining definitive answers to all these questions. In the present age, an ultimate understanding of the nature of God is finally within our grasp. It is argued here that the pieces are in place for what is known as a paradigm shift. This is where we have a fundamental change in our basic assumptions which then allows us to understand things which were beyond our grasp when the old assumptions were adhered to. An example of a paradigm shift would be when people started to see the World as being round instead of flat. This new assumption allowed people to understand why it was that only the masts of distant ships would be visible when viewed with a powerful telescope. The paradigm shift that is about to occur in the World today is one where spiritual and mystical truths will finally make perfect sense to us. This fundamental change in perspective will allow us to finally understand and have definitive answers for the deepest questions about existence, such as 'Who am I? ', 'Why am I here? ', 'What happens when I die? ', 'Is there a God?' and 'What is my relationship to God?'. At the heart of this change of World view or paradigm shift is a revision of our basic assumptions concerning the very nature of existence and reality itself. Without going into too much detail here, what this change involves is a shift from the dominant idea concerning existence, which is Materialism, to its rival called Idealism. Materialism supposes that existence is physical and that the basis of reality is matter. This is what we normally come to assume as ordinary human beings and all throughout history this idea acted as a kind of default, much in the same way the flat Earth idea was something that most primitive people came to believe. The alternative viewpoint, Idealism, supposes that the nature of existence is consciousness, that is, it is the view that it is our internal subjective reality that is ultimately real. This idea is normally expressed together with the corollorary idea, that the physical universe and external reality is somehow illusory. Of the two competing ideas, Materialism and Idealism, Idealism is certainly the most counter-intuitive. But though Materialism has been the dominant philosophy throughout human history and throughout just about all the World, at the same time the philosophical position of Idealism has always had its adherents. The problem for the supporters of Idealism has always been that it has been impossible to argue convincingly how the idea could work in practice. Nobody has been able to present a convincing and compelling case in favour of Idealism or the idea that the nature of existence is consciousness. It is asserted here and demonstrated elsewhere on this website, that this state of affairs has changed. See the Nature of Reality section (the-nature-of-reality). Finally a powerful and plausible case for Idealism can be made. It is also a vision which brings together and unifies science, religion and philosophy. At the heart of this new understanding is the provable idea that everyone is God. To put it another way, we might say that the mystery of consciousness and mystery of the nature of God are one and the same. Furthermore it is the demonstration of Idealism, as discussed already, that everything is consciousness, but also that everything and all existence is One Consciousness. That One Consciousness is God and it is also our true nature. So therein lies the proof of Idealism. We may prove unequivocally that all existence is consciousness by experiencing the ultimate mystical state and revelation of our real identity, that is to reawaken and return to become God again. This proof of Idealism is also the falsification of Materialism because the experience of being God is accompanied by our being able to totally see through the illusion that there is a physical world 'out there'. Indeed the state of being God is the realization that we are the generator of the illusion of an external material universe and also the knowledge that we are the Universe reflecting upon itself. So what has all this got to do with the prophecies? The answer has to do with the notion of a 'Final Revelation'. The word 'Apocalypse', given a literal translation from Greek to English, means 'the unveiling of the hidden thing'. So the Apocalypse can be taken to mean revelation of some ultimate secret. Religion can be seen as a cumulative process of progressive revelation. That is, as we have advanced through human history, our understanding of God has been steadily augmented and refined by the Prophets, Saints and a countless number of assorted mystics. What is being suggested here is that this process has a point of culmination and that this should occur at the time of the prophecies. It is the Author's belief that the advanced state of human knowledge in science, philosophy and religion has set up the conditions for this final revealing of the truth about God. That is, because it can be argued that the idea that everyone is God can now be communicated in a coherent, compelling and convincing way, this also means that the time of the Apocalypse or the 'unveiling' is upon us. We come now to the conclusion of our discussion concerning historical conclusions and end times. So we live in a world that is quite special and unique. There are things about our present age that are quite unprecedented. Among these are the coming One World Order, the perilous state of the Earth, the universal decline of religion and the advanced state of human knowledge. I have tried to present a case in which these features of the World in which we live today have been foretold and prophesied in the holy scriptures of the main religions of the planet. So therefore, the present age is the time of the prophecies. Ultimately my view of the meaning of the prophecies is this. In the end what I am saying is that the history of humankind, and indeed the process of life on Earth, is a continuous, progressive and cumulative process. When we talk about the evolution of life, refinement of human culture and the advance of science and technology, then these are really different angles on the same planet-wide process. I believe that this process has points of culmination and meaningful termination. What I mean by this is that all through the planet's long history there have been special times when some critical point was arrived at. These special moments in time mark the beginning of some dramatic phase change or new order of things. Examples of these might be the first coming into being of multi-cellular organisms, the appearance of the first land animals or the beginning of human civilization. In the same way, I believe that the coming One World Order and the final Revelation of the truth of God is a transition and phase shift of awesome magnitude and historical consequence. So it is this that the prophecies are really talking about. It so happens that these events are accompanied by the perilous state of the World and spiritual malaise we find ourselves in. But it may be considered that perhaps these are necessary circumstances for a unified humanity to emerge and a state of affairs which is conducive to a global spiritual re-awakening. Anyway, this is the state of affairs that we find ourselves in today in the World and it is also what has been prophesied long ago in the various spiritual traditions of the World. Therefore it is reasonable to believe that the times we live in today are the times prophesied. I have tried to present a view of the prophecies that is sensible and also one that doesn't put people in a passive state of awaiting some kind of saviour to appear or for the prophecies to happen of their own accord. What the view of the prophecies that I have presented does is to give people a conceptual framework or roadmap for understanding what is happening in the World. But at the same time it is a perspective which allows people to be agents and protagonists in the unfolding of the prophecies. It gives people a way of understanding the purpose of human history and also perhaps a way for a person to find meaning in his or her own life, in relation to the prophecies. We are living in a time like no other. If 'the prophecies are now', then what will be their outcome? What do they say about the future fate of the humanity together with the Planet? If the Prophecies contained in the World's major religions are talking about the unprecedented and unique conditions of present times and the World in which we live today, then what's going to happen next? What will be transpiring in relation to those issues which define the age and which correspond to the Prophecies? A New World and a New Order comes into being, one that is Just, Equal, Fair and Peaceful. Finally, but not least, a World of Understanding, Enlightenment and Spiritual Awakening is brought into being. In this page are links to other pages concentrating on prophecies contained in some of the major Religious and Spiritual traditions of the World. Also I have included some predictions of Nostradamus and there is an article on 2012 which is the special date when the Mayan calendar comes to an end. In each section I give some background to the prophecies from the respective World Religions and also discuss some of their social and political implications. The list of included prophecies and articles will grow over time as I sort through my papers and book collection. If any readers have any ideas of things to include then any suggestions would be most welcome. Go to the Contact section to get in touch.